← Random Panel: On cable, sure, but not on the networks! Isn’t that just the weirdest image, DJ? Glad I wasn’t the only one who went there with it, it just jumped out at me and I was at a loss for words. It is! And the old guy look at it like WHOAH doesnt help its case. Its a hillarious panel. I think the beleaguered man resembles George H.W. Bush. A bit of explanation is probably in order. The image in question is from “Impact Winter Special No. 1”. 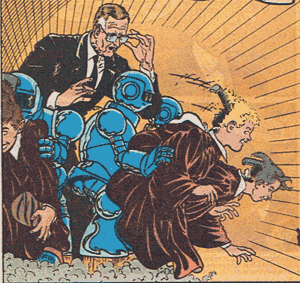 The boys’ choir performing for President George HW Bush throws off their robes to be revealed as robot henchmen bent on kidnapping the President. The positioning of the figures in the panel, coupled with the President’s expression, certainly suggests there’s something else going on, but it’s all fairly innocent. At least, as innocent as the kidnapping of a head of state can be.